We have very limited quantities at this price. Shipping>>Buy 2 Free Shipping worldwide via Express. 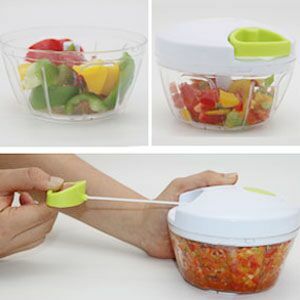 This speedy manual food chopper will help you cut vegetables, fruits and nuts. Putting the food into the bowl and pulling the rope once can chop food 15 times. Even the onion will not make your eyes watery. 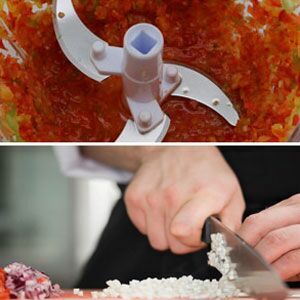 You can also make dips and chutneys in it .This chopper not only chops vegetables and fruits, but also can be as mincer and grinder to mince boneless meats and cottage cheese. The material of the hand pull chopper is nontoxic plastic .The sharp stainless steel blades are fast to chop and mince. The bowl is BPA free and safe for containing food. This manual food chopper has advantages of simple structure, economy, practicability, compact volume and convenience. 3 cup capacity is good for small kitchens, RVs, travel and camping. Put the food into the bowl of the garlic chopper, then close the lid. Pull the rope to make the blades rotate. The more times of pulling, the smaller pieces it will be ,and it cuts foods quickly and easily. 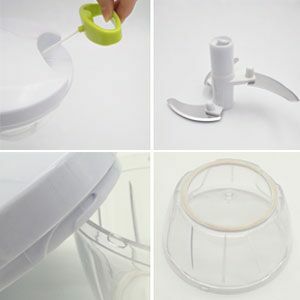 The bowl and the blades can be separated, so it is convenient to be washed.The lid can be wet,it has 3 outlets on the lid. This versatile tool makes quick work out of tough cutting tasks, and it's so easy to assemble, use and care for.And if you hate getting watery eyes when chopping onions, this will solve it all for you. With the lid on top and onions inside the bowl, you can effortlessly chop away without them making your eyes water.It is the quick and easy way to chop fruits, vegetables, nuts, and herbs or create fresh salsas, pestos, coleslaws, salads in just seconds. A lid with pulling cord: Easy to pull the cord with handle smoothly for operation. Three stainless blades: Features sharp stainless-steel blades for fast and durable chopping. Three rabbets on the lid: Ensure the lid is securely sealed with chopping bowl for safety reason. Anti-slip base: Anti-slip base to ensure the chopper stands firmly during operation. Place the blade on the little post in the container carefully.Cut the vegetables or fruits in smaller pieces at first and then put them into the bowl.Place the lid on the bowl firmly.Hold the lid with one hand and pull the handle with the other hand to chop the food as your desired size. 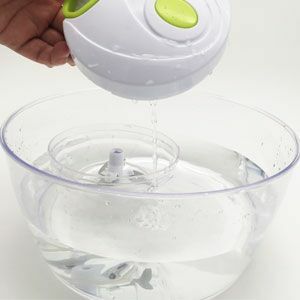 Components come apart for easy cleaning.The lid is designed with three opening for easy cleaning in water. Need to pay attention to sharp stainless-steel blades when you clean it. Vinipiak chopper is made of BPA-Free and Non-Toxic material as a safe food tool.Easily clean and easily use. Vinipiak chopper is designed with sharp stainless-steel blades for fast chopping, comfortable soft grid lid, anti-slip base and easy pulling cord and a large handle for effortless operation. Try it now and you will love it for sure!